Take a stroll down memory lane as The Best in Motown Tribute Music Production pays legacy to The Four Tops, Temptations, and Supremes in Northern Michigan! On Saturday, April 9 from 7 p.m. to 9 p.m., the Kirtland Center for the Performing Arts hosts a three-group tribute Roscommon event filled with memories and excitement. 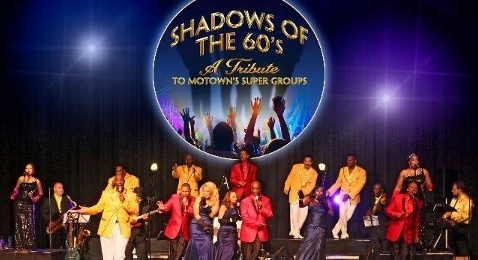 In this Tribute production show, Shadows of the 60’s phenoms perform hits that span several decades. Great care is taken to reproduce the music, note for note, and in the original keys and arrangements. Three Super Groups will perform on one stage with a grand finale featuring the music of Motown’s Smokey Robinson, Marvin Gaye, Stevie Wonder, Gladys Knight, Martha Reeves, Junior Walker, and more! Be sure to bring your friends and family and join the Kirtland Center for the Performing Arts in Roscommon for a night of musical pleasure with stunning choreography and costumes. Shadows of the 60’s is truly a concert for everyone! Tickets for the Roscommon event cost $35 in the lower level and $32 for the upper level.